These large brick copper mosaic tiles look gracefully aged to adorn your kitchen backsplash, bathroom backsplash, fireplace surround and other wall decor applications. 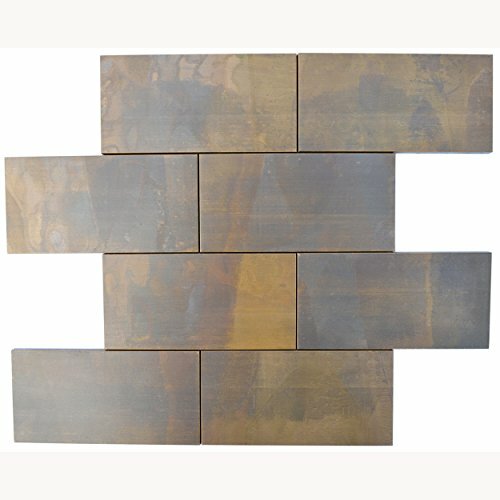 The beautiful antiqued copper finish gives each one its own unique identity with varying shades of brown and copper colors, and ultimately makes for an unforgettable copper kitchen backsplash, accent wall, fireplace surround or bathroom wall. Let the coziness begin. This copper mosaic tile is made with real pieces of copper that have an antique finish. This mosaic tile features large sized brick shaped copper tiles of roughly 3" by 6" each. The tiles in this sheet are mounted on a nylon mesh which allows for an easy installation. View More In Decorative Tiles. If you have any questions about this product by Eden Mosaic Tile, contact us by completing and submitting the form below. If you are looking for a specif part number, please include it with your message. CHINA Decorative Tile Stickers Set 12 units 6x6 inches. Peel & Stick Vinyl Tiles. Home Decor. Furniture Decor. Backsplash.